"Achieve your milestones due to connected financial data." Our job consists in providing decision-makers with actionable data to assist them in their decision-making. dashboard.lu has been developed by Muller & Associés to render all types of data – financial or non financial - both dynamic and understandable. IT tools have been developped to improve the connectivity with our clients and to maximize the automatization in the bookkeeping and accounting processes. Muller & Associés has rallied a team multilingual professionals with various backgrounds (economists, software developers & accountants) with notable track records in banking, large audit firms, IT companies and family-owned businesses. Our common language is Luxembourgish, but professional work is carried out in English, French and German. “A company is driven like a car; above all, you must not focus exlusively on your rear view mirror”. The balance sheet fulfils a legal obligation, but it does not allow a manager to use it as a decision-making tool, as it is often difficult to read and it contains information which rapidly becomes obsolete. 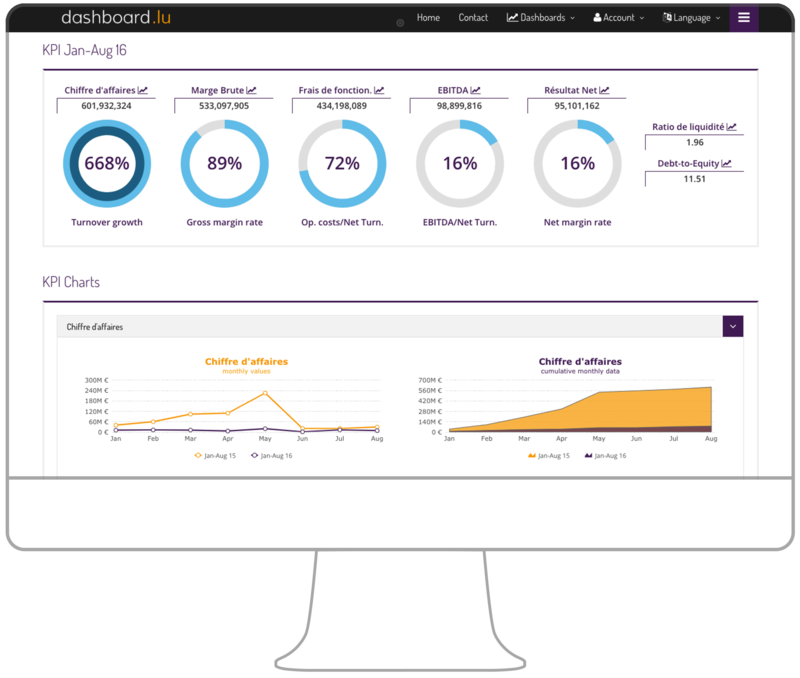 – Dashboards built directly from the collection of your data. Frédéric is a graduate of the Institut Supérieur de Gestion (ISG) in Paris and a chartered accountant in Luxembourg. Before joining Muller & Associés, he spent 4 years auditing at Deloitte. He’s been co-heading Muller & Associés since 2006, and is a member of the board of a number of companies and associations. – Coach at the Luxembourg School for Commerce (LSC). – Member of the FJD (Federation of Young Business Leaders of Luxembourg). – Treasurer of the Enner Dach ASBL. Frédéric speaks English, French, German and Luxembourgish. Laurent Muller holds a doctorate (Ph. D) in economics and a master’s degree in international business administration. Before joining Muller & Associés, he spent 3 years as International Project Manager at Paul Wurth S.A.
He’s been co-heading Muller & Associés since 2006, and is a member of the board of several commercial and industrial companies. – Member of the “Research Unit for Industry and Innovation” in France. Laurent speaks English, French, German and Luxembourgish.